The camera seems to affect people in multiple ways but a camera at a restaurant tends to elicit more negative reactions than not. We don't talk too often about what the life is like running a food blog but it does make a huge difference on our experience. That's why I have a section for "Eatery" posts which are our incognito adventures out (and thus, actual reviews) and why media visits are pointed out; you know which are anticipated and not by the restaurant. Well, we visited Bonefish Grill one evening based on an invitation but things went wrong, and there were very notable parts of our dining. To be fair, they did have some pretty good seafood but the rest of the dinner needs a little more explanation. We were invited to try out their newest Fall Crush menu which was the name for their seasonal offerings. 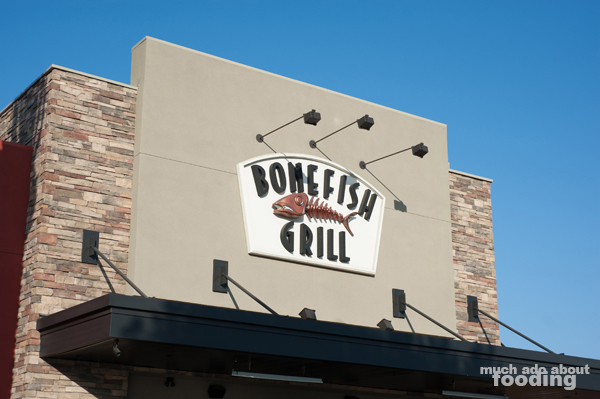 Since Bonefish Grill opened at The Marketplace in Tustin, we have not yet been but I had been eager to try it after seeing pictures and reading the menu. It was a nice surprise to get the invite so I set up a reservation to try them out. Strangely, when we arrived, the hostesses looked confused when I stated I had a reservation. They definitely could not find it but kindly seated us without much delay, eyeing the camera in Duc's hand. I could almost feel the tension, and we realized it might not be a great meal after all. Because they were not expecting our visit, the restaurant seemed a little on edge about why we might have such a set-up with us. I can only imagine what the industry as a whole dislikes about people who are blatant about writing reviews on a restaurant; it does not leave a good first impression and I was worried we would be categorized as such. 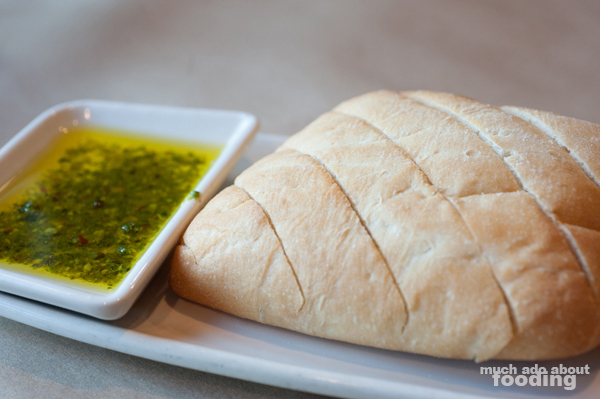 We started off with some of their bread which was great in its pesto olive oil. 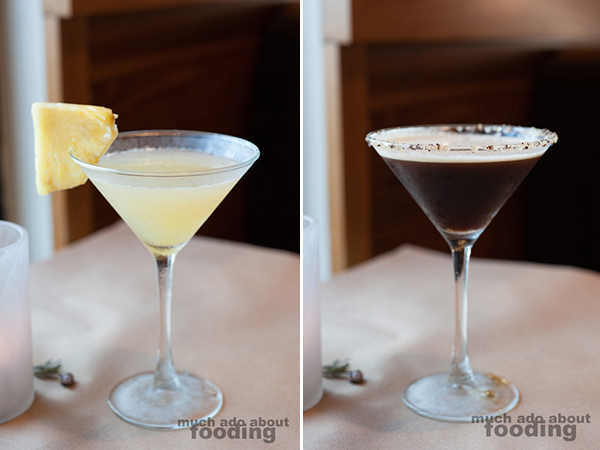 Drinks were tried - their Fresh Pineapple Martini (Malibu rum, St. Germain, fresh pineapple, lemon, and a homemade vanilla bean simple syrup) and Espresso Martini (Svedka Vanilla vodka, Kahlúa, Crème de Cacao, fresh brewed espresso, and chocolate sugar rim) were our choices. We had some confusion at first because the pineapple martini was listed both on the regular cocktail menu and on their Fall Crush menu but the descriptions were entirely different. With the new seasonal fare came a new recipe for the drink so once that we cleared up, we went on with it. Unfortunately, we found the pineapple martini much too heavy with the coconut flavor in Malibu but the espresso had a good combination of ingredients and texture of the rim. Shoot for that one if you are a fan of Kahlua. Surprisingly, the cocktails came after the appetizer of Cold Snap Fresh Ceviche (served in a frozen glass made entirely of ice - Bay scallops, shrimp, fresh fish, vegetables, avocado, cucumber, jalapeño, citrus, cilantro, and warm tortilla chips) but it was a small detail at the time. The ceviche was uniquely presented in its own tall glass of ice which kept everything constantly cold. The chips that came must have been house-fried because they were still sopping with fry oil; that's a miss for me! However, the ceviche itself was so fresh and fun that it was eaten with and without the chips. I really enjoyed how cleanly the seafood shone through. Once we finished the ceviche, our entrees took excessively long to appear (and I wasn't being impatient). The table that was seated after us behind our booth had received their appetizers and nearly finished their entrees before our own came to the table. Every time someone would pass by, s/he would look warily at Duc snapping pictures of our food. Were they under the impression that we were the types to write scathing reviews? Is that why our water glasses were never filled once? When a media visit is expected to happen, we do not receive any extra or unnecessary attention for the photos being taken but when the staff is not informed, we receive strange and usually unpleasant service. It was an odd experience that truly detracted from what we were present to enjoy - the food. He went ahead and ordered their Malbec Marinated Steak & Shrimp ($20.90 - 6 oz center cut sirloin topped with wood-grilled shrimp, served with Dona Paula Los Cardos Malbec mustard sauce and choice of fresh side item) medium rare with sides of mashed potatoes and corn couscous. It came medium well and a little tough, to our dismay; there was also not much of a hint at the Malbec marinade. However, the shrimp was superb with just the right amount of seasoning and doneness. We both dug readily into the mashed potatoes too that were oh-so-creamy. The corn was not as pleasant and didn't have the texture that fresh corn has. 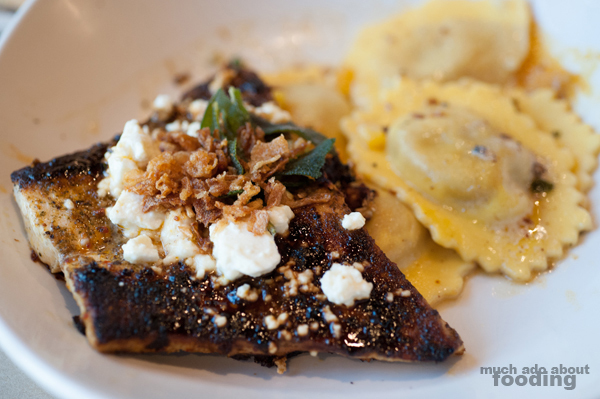 I went for their Swordfish & Pumpkin Ravioli ($20.90 - topped with Feta, crispy sage, and shallot brown butter), both options from their Fall Crush menu. The pumpkin ravioli had a thick and grainy dough outside of a soupy pumpkin filling that seemed more like sauteed squash than pureed for a more cohesive interior. That was became an unfinished portion of the meal. But yet, the swordfish came through to save the dish because it was excellently, barely charred on the outside, moist, flaky, and well-seasoned. The Feta did not make very much sense for the dish because of its saltiness but the ravioli was a good fit with the sage. It was a love-hate relationship right on the same plate! 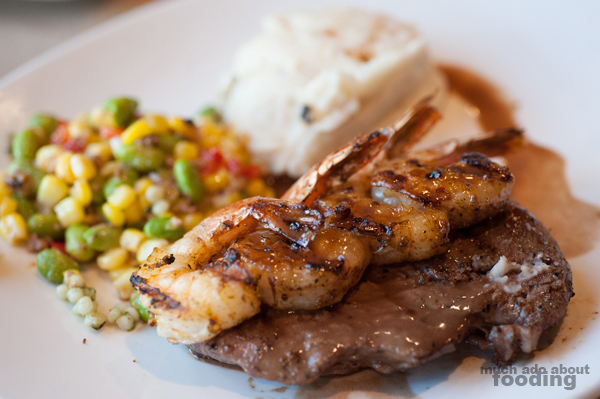 Overall, if you are going to visit Bonefish Grill, I'd really suggest keeping to the seafood options because all of their dishes' seafood components were very enjoyable; the other proteins fell flat that evening. Also, I hope that your experience with the service goes more smoothly! Photography by Duc Duong. More photos available on Facebook here. 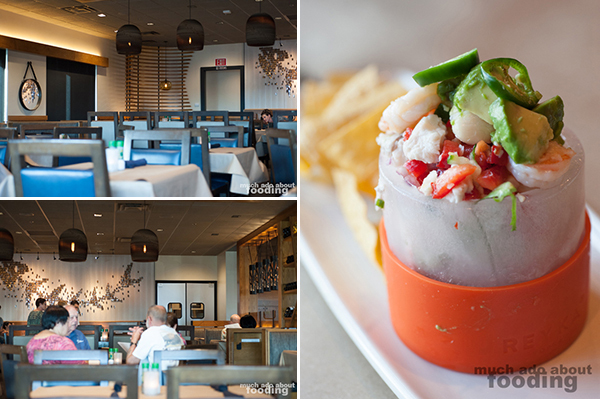 Del Frisco's Grille Irvine Brings On the Brunch! Copyright © 2017 Much Ado About Fooding.